I have wanted to do a kimono jacket refashion since 2015 when I saw it on Portia’s refashioners challenge. 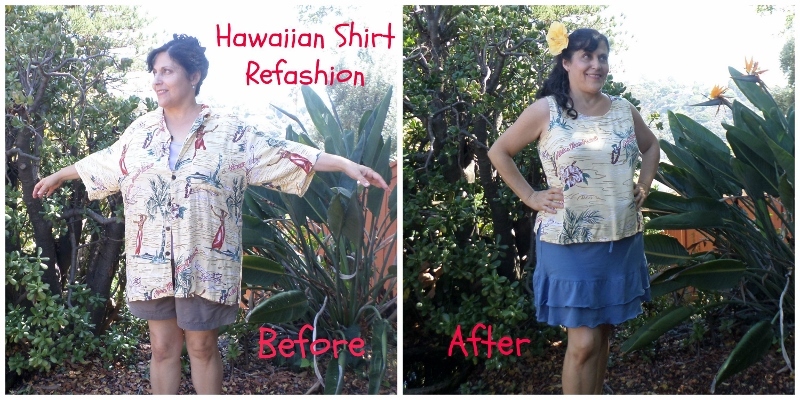 Her Makery blog tutorial uses two shirts. I had this thrifted men’s Perry Ellis size large shirt in my stash. I thought the fabric felt like a very soft peachskin rayon, and then rechecked the label. No, this is silk. Perfect! I cut off the collar, buttons bands, and the hem. 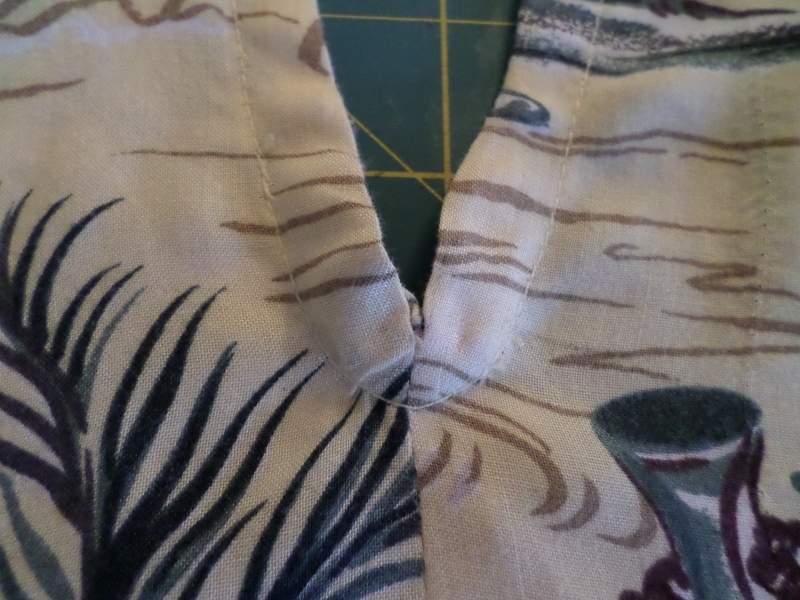 I cut a line from the shoulder to the hem on a slight diagonal. I pieced together a long facing strip from the cut off portions, sewed it around the full length of the jacket, and rehemmed it shorter in the front. I then turned the facing to the wrong side, pressed it with the seam rolled to the inside, and stitched it down. Can you believe how easy this was? 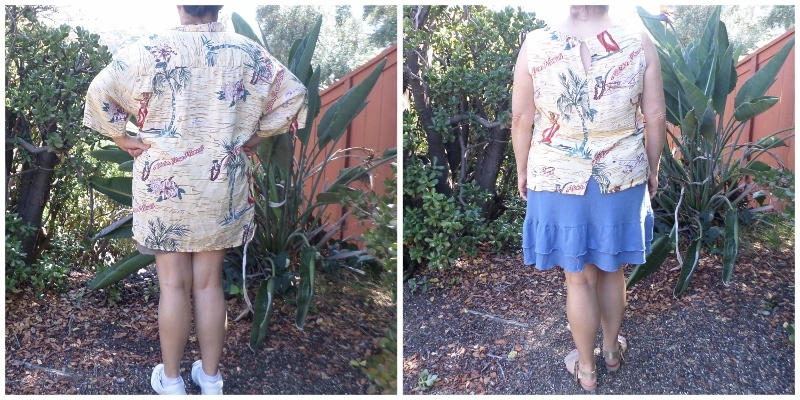 This entry was posted in Refashions, Sewing, Thrifting and tagged before and after refashion, kimono jacket, men's shirt refashion on July 20, 2018 by Stitch It Again. 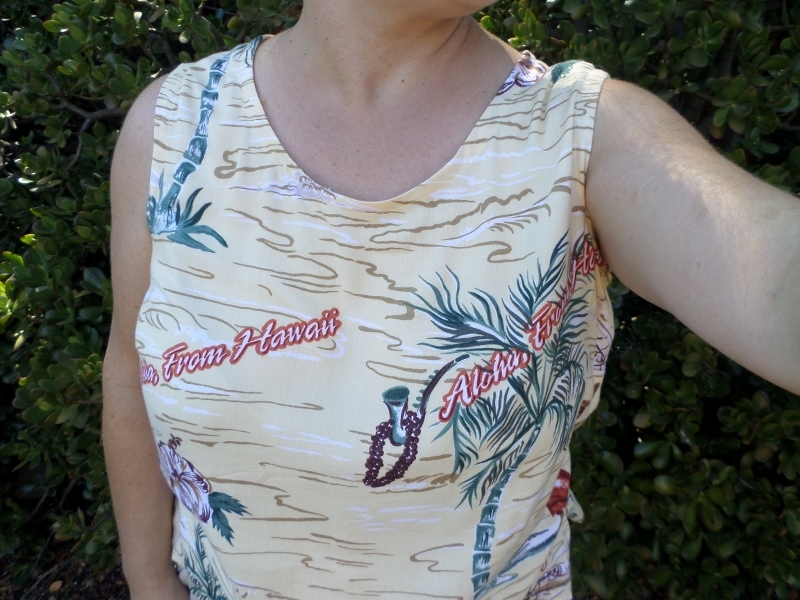 I just couldn’t resist this “Aloha from Hawaii” men’s large rayon shirt I found at the thrift store. I thought it would be cool and fun to wear for my weekend getaways… to places like the drugstore. I’d already done the first two alternatives, so I wanted to try the third option. I removed the pocket, snipped up the sides of the shirt, cut off the buttonholes and removed the buttons from the other side of the shirt. 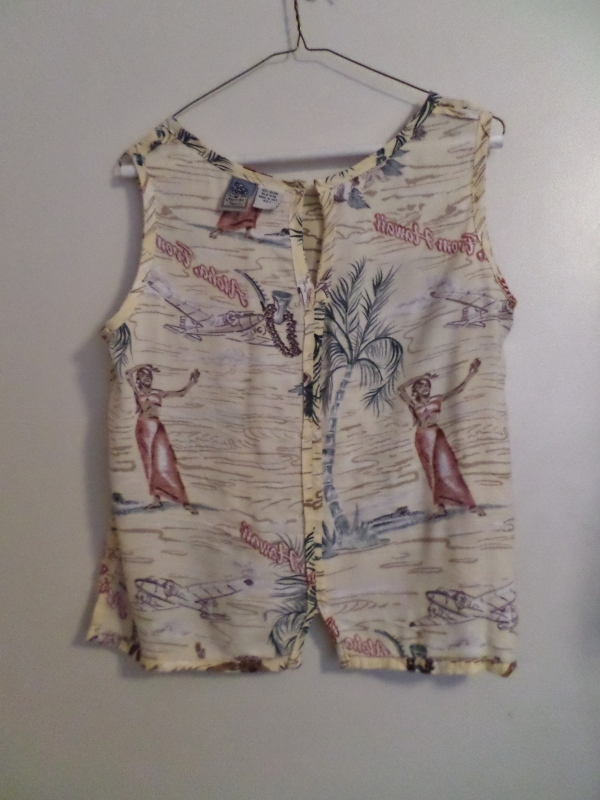 I got out my Colette Sorbetto pattern to cut out the shirt. The back of the shirt became my new front. 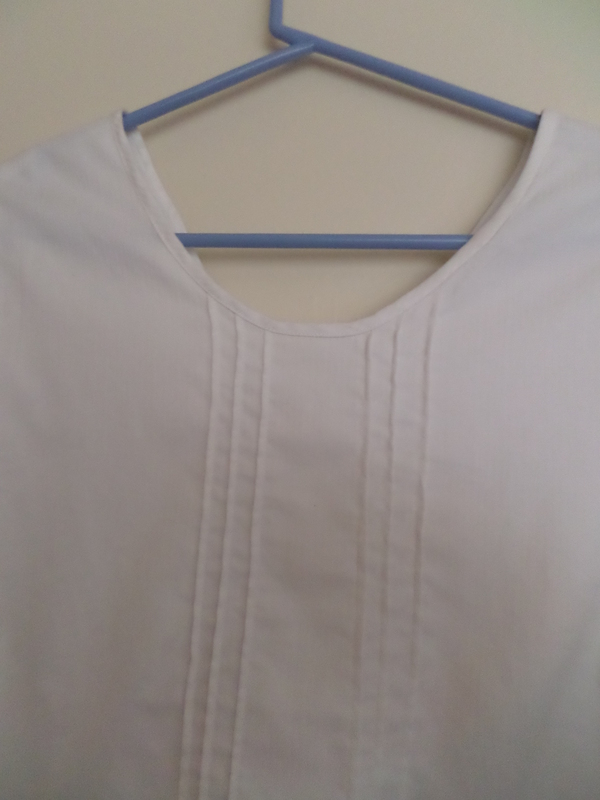 I was able to cut it out below the yoke with the intention of using the original hem. 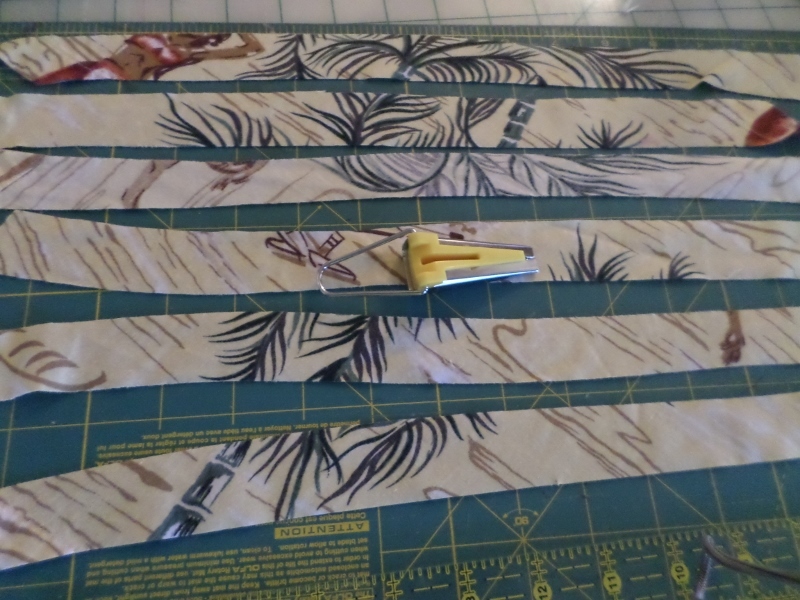 Since I was going to be putting a seam in the back, I placed my pattern pieces about 5/8 in from the edge allowing for a seam allowance on both pieces. Once I had my pieces cut out, I stay stitched the neck to keep it from stretching out of shape. Every time I make a shirt I’m always making changes trying to get the darts right. 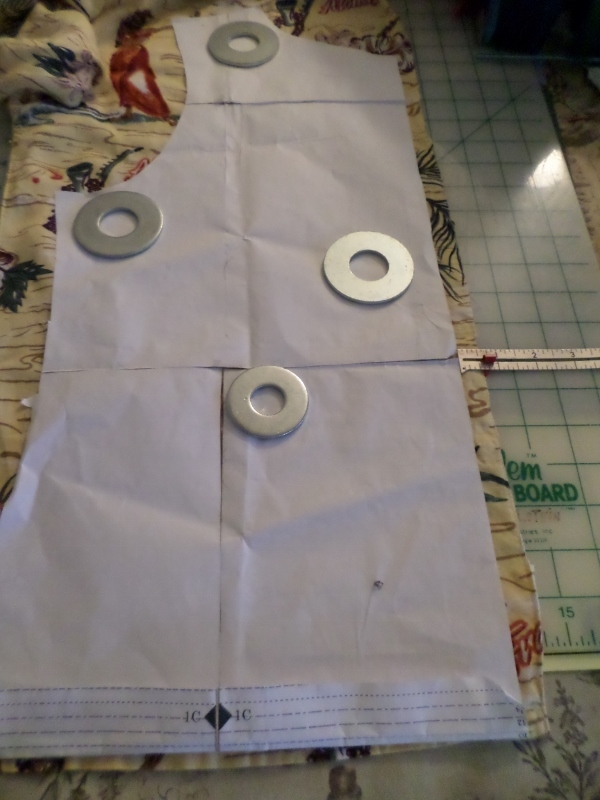 This time I kept them at 1 inch wide, but I moved them down 1 inch to start at 3 1/2 inches down from the top of the shirt and I had them end 5 inches from the side of the shirt. It worked; they looked good, and no armhole gap. I sewed up the back seam, leaving a slit at the bottom. I decided to add a feature I’ve never tried before: a keyhole opening at the neck, with a button closure. I was unsure how to do this – with facing? bias tape? do I cut further into the seam allowance? I cut a slight oval because I wanted the opening to be visible. I used bias tape made from the shirt and had to redo it a few times before I was satisfied. I machined basted the side seams, made fitting adjustments, and then took the shirt apart and transferred the changes to the pattern. I took one sleeve and made 1/2 inch bias binding from it for the neckline, armholes, and keyhole. I used the binding as facing, sewing it to the right side of the shirt and then turning it completely to the inside and stitching it down close to the edge. I reattached the tags as I sewed the neckline. I finished by making a thread loop for the button. 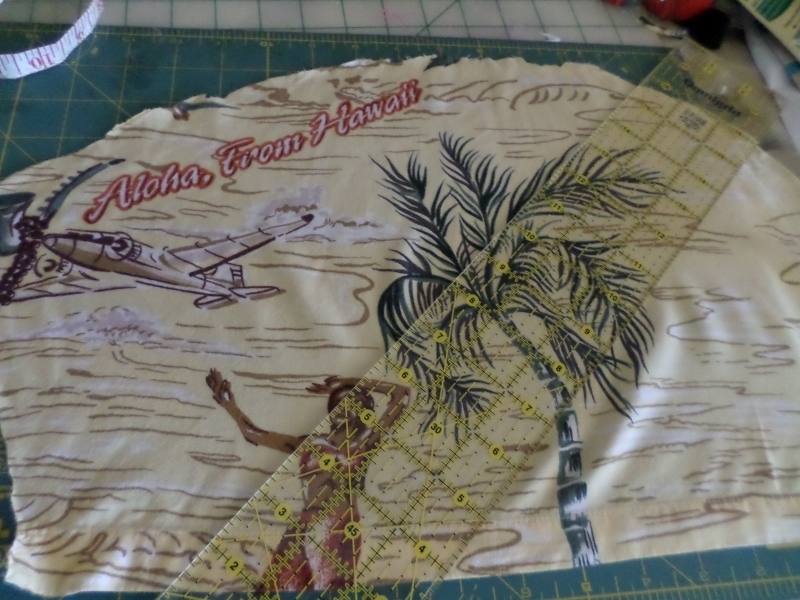 When I started cutting the shirt, I noticed that the shirt had a strategic print placement with most of the hula girls and airplanes on the front of the shirt, while the print on the back was more subdued. At first I worried that I had made a mistake turning the shirt around, but decided I liked the new less loud front just fine. I wore it right away! I love it! The calendar may say fall, but the weather in southern California still feels like summer with shorter days. Now if I can just find a solid color men’s rayon shirt I will be all set for any occasion. 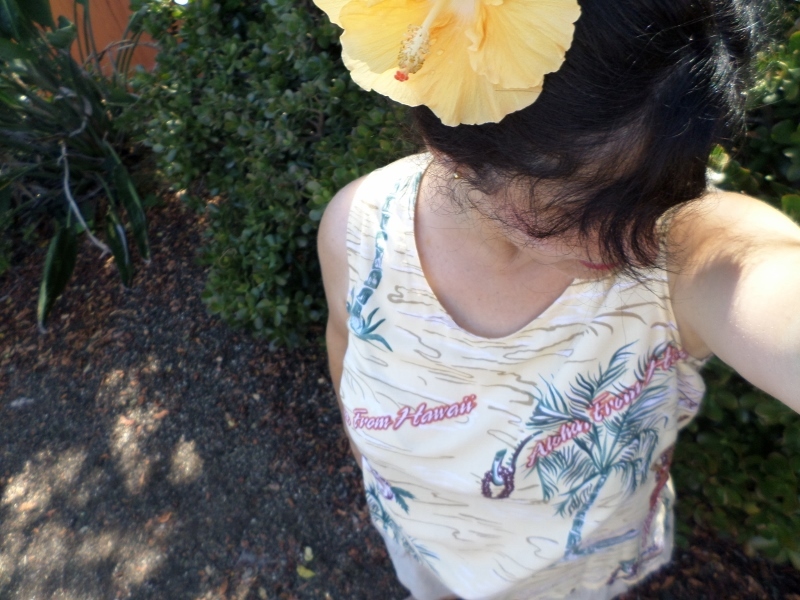 Look who also posed with this enormous hibiscus flower. I caught some funny expressions as Sparky smelled it, licked it, and cast an uncomfortable sidelong look at it. 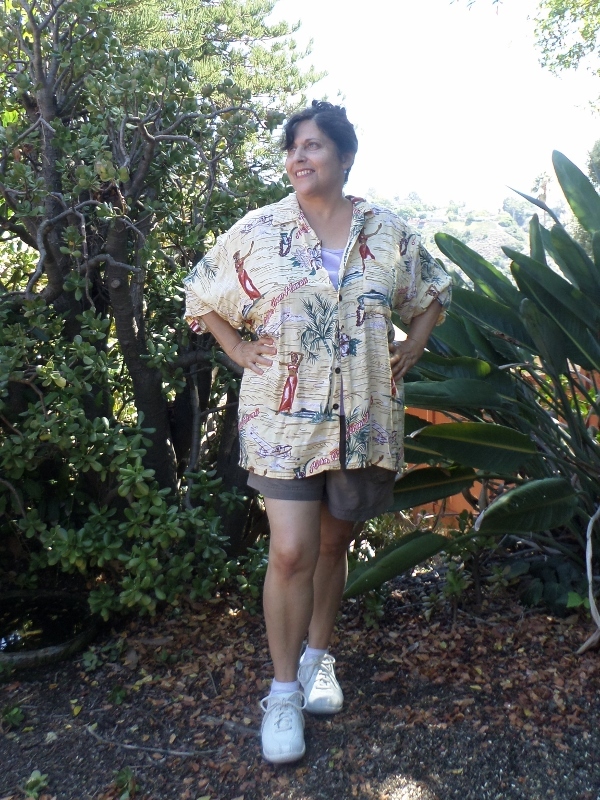 This entry was posted in Refashions, Sewing, Thrifting and tagged men's shirt refashion on October 7, 2015 by Stitch It Again. While doing some cleaning and reorganizing I noticed that my container of thrift store clothes waiting for their makeover was overflowing. Time to get to work! I decided to start with a simple men’s white dress shirt. It’s cotton with a subtle shadow stripe. When refashioning a button-up shirt you have three choices: keep the buttons in front, turn it around and put the buttons in back, or eliminate the buttons altogether by cutting out the placket or sewing it up. 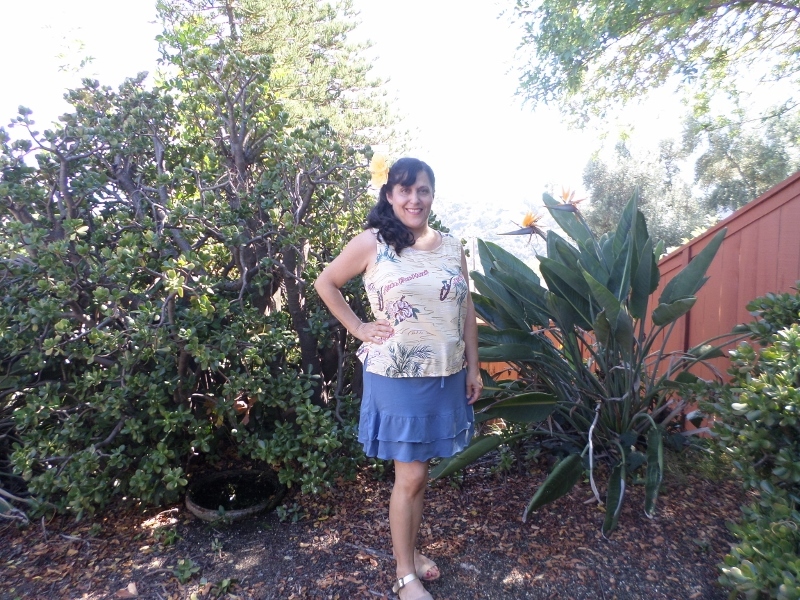 Ever since I saw I this fantastic refashion from Carissa Knits, I knew I wanted to make one like it. It was based on the free Sorbetto pattern, but with pintucks. So it’ll be buttons in the back for my feminine blouse. 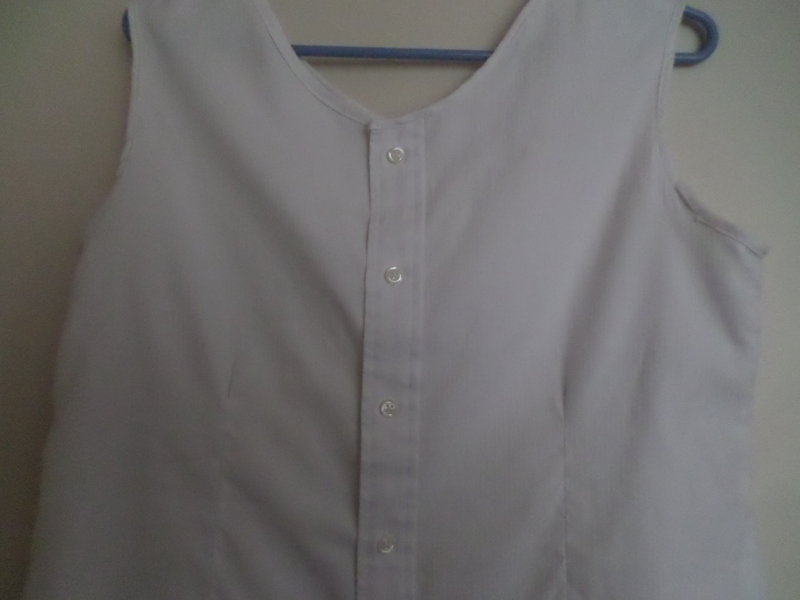 First I removed the pocket, cut off the sleeves and the collar, and cut the shirt apart at the side seams. I sewed in as many pintucks as the width of the shirt allowed. I measured the width I would need by measuring across the modified Sorbetto pattern I had used before with the pleat folded away. 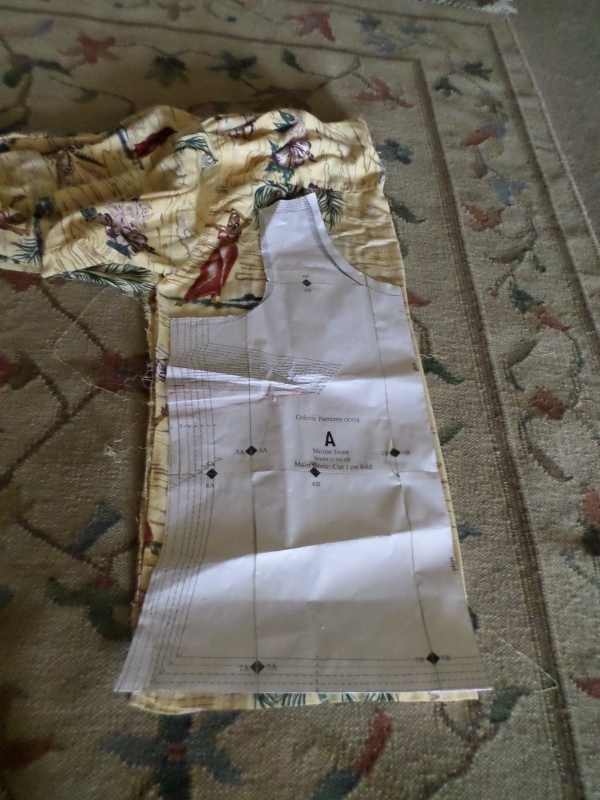 My previous modifications to the pattern were to make the shoulders wider and the neckline higher, and to enlarge the size of the bust dart and to change its placement. I cut out my (new) front and back, and made bias binding for the neckline and armholes from one of the sleeves. I put my revised darts in the front, and two contour darts in the back. 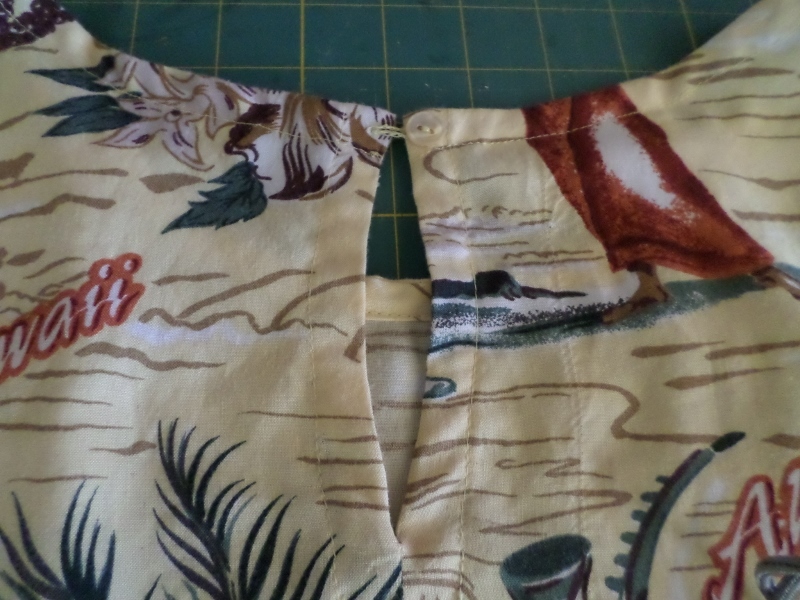 I used my rotary pinking blade to finish the seams. I wear sleeveless tops and shorts at home and for going out on my own time for about half of the year, but sometimes want to look more put together and presentable for going out than wearing a tank top. So now I have a basic blouse that will go with everything, and that I can accessorize. I’m ready for summer! 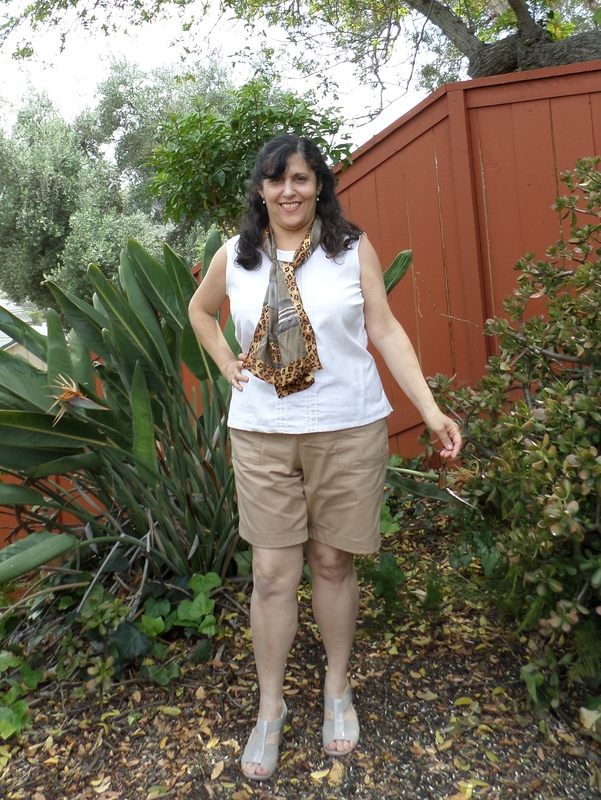 This entry was posted in Refashions, Sewing, Thrifting and tagged Carissa Knits, men's shirt refashion, pintucks on June 7, 2014 by Stitch It Again.